This is one of my all-time favorite photos that I have taken. 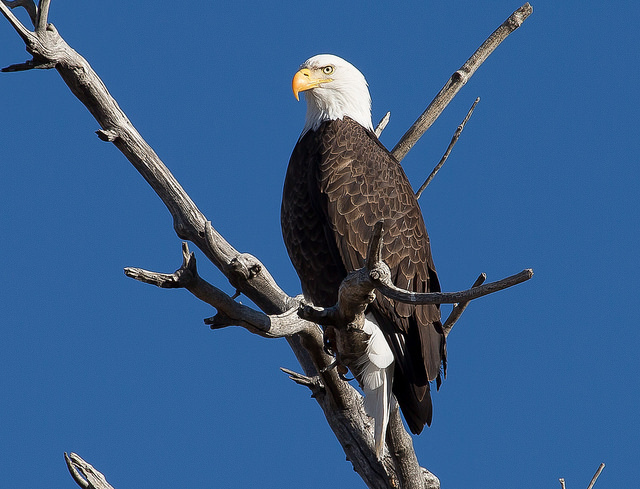 There are often one, or two Bald Eagles that nest down in the open space in Broomfield, Colorado, near my house. I run past them all of the time, but never have a camera ready. Then, the few times I go down there with a camera, they are gone. Finally, last week, I got lucky and had my 5D3 and my 100-400mm lens with me, on a clear, bluebird-sky day, and this beautiful specimen posed for me for at least 20 minutes. I must have been only about 20 or so yards away!